Air Factory Frost - Melon Lush Ice 100mL A rendition of a taffy treat with a burst of sweet, mo..
Air Factory Frost - Blue Razz Ice 100mLA tasty blue raspberry treat with a balanced blend of sweet a..
Air Factory Treat - Strawberry Crush 100mLA savory strawberry blended candyVG/PG: 70/30 Availab.. Treat Factory - Custard Craze 100mLCustard Craze by Treat Factory is a creamy vanilla custard that o.. Treat Factory - Lemon Glaze 100mLA fresh-out-of-oven delicious dessert pastry coated with sweet tast.. 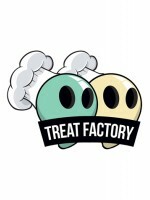 Treat Factory - Kookie Krunch 100mLSweet and crunchy cookie dough bites!Available in 100mL bottles i.. Treat Factory - Jaw Dropper 100mLAn everlasting hard candy that will leave your mouth watering.Avail..